"Sampath Speaking" - the thoughts of an Insurer from Thiruvallikkeni: Police chase ~ man jumps into Coovum : not Billa story !!! Police chase ~ man jumps into Coovum : not Billa story !!! Chase by police cops often are the climax of many a films… if the hero is the Police Officer, the villain and his gang would somehow get caught or die trying to escape………. Heroes would always run through narrow lanes – and Cops would never be able to catch them, even when they are close…. Napier Bridge is an important landmark – often shown in films to show that scene occurs in the city [LIC Building, Central Railway station are the other].. this bridge is built over the ‘Cooum River’ – not exactly looking like a river now-a-days. Reportedly it is the shortest classified river draining into the Bay of Bengal. This river is about 72 km in length, flowing 32 km in the Urban part and the rest in rural part. 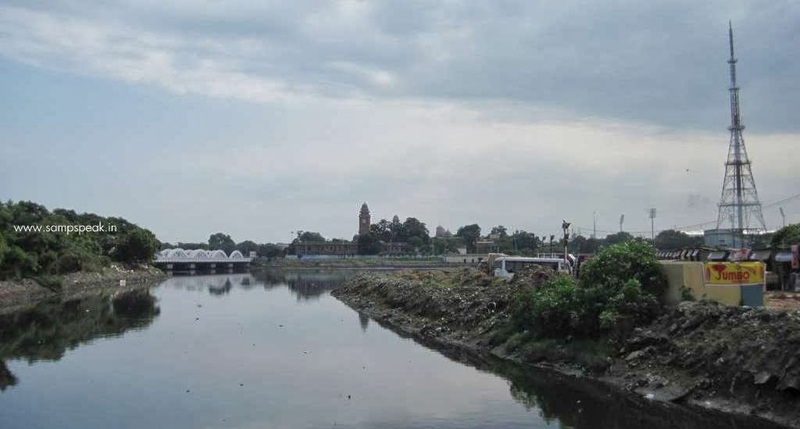 Much money has gone in the drain with successive Governments claiming to clean up the Cooum river spending crores of rupees and opposition alleging scams. Rajnikant starrer ‘Billa’ released in 1980s ran packed houses – the hero, chased by police (DSP Balaji) – escapes in a police car, winds through narrow lanes, hits obstacles, straddles on a horse ….. and nearer marina beach, shot by Police – jumps into Coovum river from this bridge ……… Arjun in Mudhavan also jumps into the very same coovum …. In the Madhavan movie ‘Run’ – Vivek coming to the city from a village is duped into bathing in the muddy Coovum river – much water has flown under the bridge in the past few decades. Coovum no longer looks a river – with its pollutants it looks so ugly and more at the estuary after Napier bride. Francis Napier, a colonial administrator, served as a Governor of Madras from 1866 to 1872; he also acted as the Viceroy of India from February to May 1872, temporarily though arising out of the assassination of the Earl Mayo…. and the bridge leading to Fort St. George / War Memorial overlooking island grounds is named in his honour. Chennaites use this bridge this often, as it connects the erstwhile British settlements [Fort St George / Parrys] to other southern parts of city of Chennai. The landmark bridge was built in 1869 and widened to two pronged lanes in 1999. Not many of us would have seen the coovum nearer Chintadripet – from the Langs Garden side, one can have glimpse of Rippon building standing majestically. 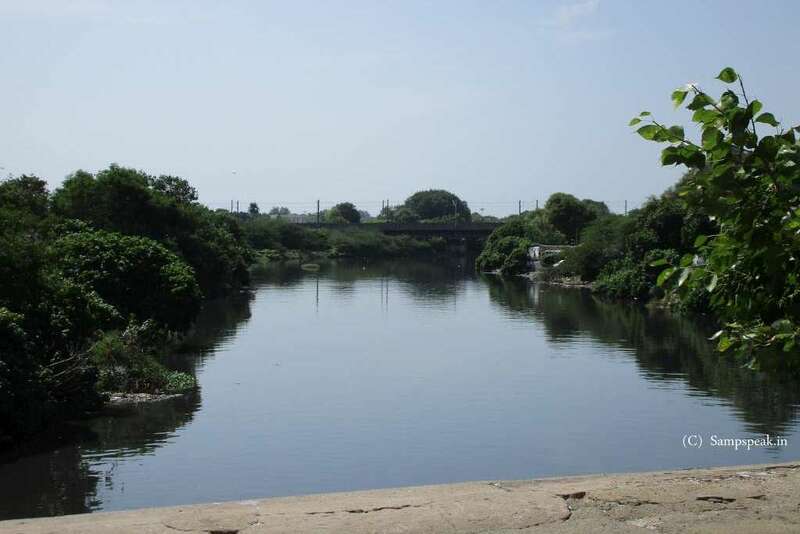 TOI reported that a 36-year-old man jumped into the Cooum river at Chintadripet on Friday (26th Aug 2016) afternoon to escape from policemen who had come to question him in connection with the escape of his brother from custody two days ago. It is reported that Police and fire and rescue services personnel were combing a large stretch of the river till late in the night but were yet to find him. Around 3pm, Arun was at the Chintadripet home where he lived with his wife Sudha and three children when a team of the Kannagi Nagar police came looking for his brother Arputharaj, 27. The younger man had been picked up on Wednesday with a dozen mobile phones during a vehicle check in Thuraipakkam. As he was alighting from the patrol vehicle, he pushed down a constable and fled. On Friday , when Arun told police that his brother was not at home, they asked him to accompany them to the police station. Arun initially refused but was told senior officers had summoned him. Arun asked the policemen permission to return properly dressed and went into a room but ran out through the back door. Taken aback, the policemen gave chase. He ran through Langs Garden Road and plunged into the Cooum. Police then alerted the fire and rescue services. A team soon arived and began an operation that was continuing till last reports came in. Police, later, said some residents of the area had claimed seeing Arun move towards the river bank, away from where the search was underway. Soon, Arun's wife Sudha came looking for him and blamed police for her husband's act. After a couple of days, reports suggest that the man is no more and his body was flushed out from the waters !! Tidbit 1 : In Nov 2015 when rain marooned Chennai, National Green Tribunal bench rapping Govt. said, "What you couldn't do in one year, the rain did in a day or two." In the past five decades, more than Rs 5,000 crore was pumped into projects to revive the Cooum, many of which have come a cropper. The two weeks of incessant rains naturally flushed out the muck in this river-turned-drain. For sometime following historic rains, Coovum was a sparkling picture of a flowing river. Remember that on that Black Sunday when Indian Ocean tsunami struck, lot of sludge in river Coovum was washed back and got deposited in to slum houses on the bankson Langs Garden near Chitra theatre. Weather experts stated that the back-flow into coovum had saved Chennai from a disastrous impact. Tidbit 2 : Naming the movie ‘Billa’ was an attempt to create some sensationalism – very negative at that. In 1978, two young children ‘ Geeta and Sanjay Chopra ’ were kidnapped and murdered in a gruesome act in Delhi. The killers of the siblings were Kuljeet Singh (alias Ranga Khus) and Jasbir Singh (alias Billa). The children were kidnapped for ransom but, on learning their father was a naval officer, both were killed. The kidnappers were executed in 1982. .. and Tamil tinseldom had another film [Rajni / Radhika] by the name Ranga too ! I hope they were able to catch the man. People who commits crime should be punish accordingly. That's why students from resumes.expert are studying hard to pursue a career in the crime scene investigation team.